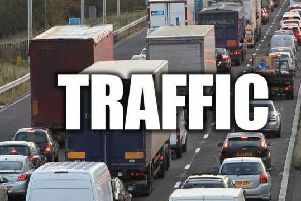 A family of four had to scramble out of an overturned car following an accident on the M62. The incident, involving a blue Peugeot, happened eastbound between junction 33 and junction 34 at around 1.10pm yesterday (Tuesday). Firefighters from Pontefract and Castleford were mobilised, but all four occupants managed to get out of the car before crews arrived. Yorkshire Air Ambulance, two rapid response ambulances, one road ambulance and the hazardous area response team were all sent to the scene, along with the police. All four occupants were taken to Pinderfield Hospital with minor injuries.